Detailed Texas surf forecast maps and the latest eyeball surf report from local surfers in the region. Near-shore swell is shown on the map together with the surf forecast rating for spots in Texas. Find the best places to surf in offshore conditions by selecting the wind option on the forecast map. Windsurfers and kite surfers can also use this option to find more favorable cross-shore conditions in Texas. Our local Wavefinder indicates where some of the best conditions are likely to be found in Texas over the next 7 days. 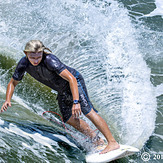 Surf photos from Texas and reviews of the best spots and surfing conditions have been provided by local surfers. Texas Surf Forecast map for predicting the best wave and wind conditions across the region. For surfers, the map shows the most powerful swell tracking across near-shore open water and not the peak waves experienced by boats out at sea. Move your mouse over the ocean swell symbols or the surf breaks on the coastline to see a more detailed surf forecast including wave period and wind conditions. The forecast updates every 6 hours and most live weather reports update every hour. You can animate the Texas Surf map or show live wind and wave conditions as reported from wavebuoys and local weather stations. 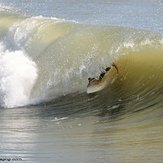 Surf breaks shown along the Texas coastline are also listed below. Think there is no surf in Texas? The Texas Gulf coast boast tropical warm waters in the upper 70's to mid 80's for most of the year along with miles of soft sandy beaches. While lacking the groundswell "screamin' tubes" often associated with more popular surf spots, Texas boasts plenty of surfable peaks year round. Find the right hurricane, and yes, you will even get screamin' tubes. 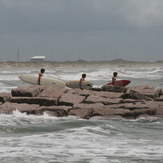 Texas is one long beach break, with the occasional jetty. Anytime of the year can work in Texas. Wind-swells are a fixture as the waves here go with the wind. Most of the year gets the south by south east winds which can regularly build surf into the waist to head high range with about a 7 second period. 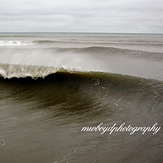 Hitting the beaches in the fall, where the occasional cold front comes through, can produce several hours of surfable peaks with excellent offshore winds. Hurricane season is awesome where surfing the 'backside' of a storm can get you extreme offshore winds with overhead screaming tubes to boot. Any hurricane traveling through the Gulf proper region will more than likely produce a decent groundswell up and down the Texas coast. Finally, if your legs are up to it, bring your long board down to the Houston Ship channel at the right time and you'll catch one of the longest rides ever on the wake of a supertanker.